For many years, people who suffered from fibromyalgia weren’t taken very seriously by traditional medical practitioners. This was because the illness was difficult to diagnose because of the nebulous symptoms. Fibromyalgia is a complex condition that includes fatigue, pain, inflammation, sleep disturbances and “foggy brain.” Fibromyalgia is, thus far, incurable. However, with proper knowledge and care, the illness is manageable. The inflammatory pain occurs largely around muscle joints and can often be debilitating. Some days it can be almost impossible to function. Areas of the body can be extremely tender to the touch. Most sufferers have “flare-ups” as opposed to constant pain which makes life extremely difficult. Depression is a common side effect of fibromyalgia. Health care providers theorize that cultural attitudes play a large part in this. Many people who suffer from this condition are accused of being hypochondriacs. Friends and family sometimes tell them that Fibromyalgia is “all in their head.” Some even think it is an excuse to be lazy. Over time, the reality of Fibromyalgia as a real illness has become more accepted in the medical world—much to the relief of the millions who suffer from it. Physicians sometimes prescribe a combination of anti-inflammatory medication and anti-depressants. Many patients find some relief in this approach, but others strongly believe that painkillers are not the solution. It is supported in scientific research that a high percentage of fibromyalgia sufferers benefit from exercise and that this approach should be encouraged. Finally, many patients have learned to focus on nutrition and turn to holistic practitioners to improve their overall condition. The studies suggest that overhauling diet can be the most beneficial approach. Examining the foundational causes of fibromyalgia is critical. The digestive system (often called “the gut”) is where most of the cause of the illness originates. Studies show that people who suffer from fibromyalgia often have a shortage of “good bacteria” in the gut. Some examples of the beneficial bacteria are lactobacilli and bifidobacteria—the kind of bacteria found in yogurt. Medical practitioners look for a leak in the lining of the intestine or “leaky gut syndrome” and then begin addressing nutritional issues through herbs, supplements, and diet. How Are We Exposed to Toxins in Our Daily Lives? Toxins are everywhere! We are just in recent years getting savvier to all the ways we are poisoning our bodies. In addition to our poor nutritional choices, we are exposed to toxins through cleaning supplies, polluted water, cigarette smoke, beauty products, and plastics—to name just a few. Living more consciously about the ways we pollute our bodies is essential for Fibromyalgia relief. It’s also important not to underestimate the effect of stress and negative thought patterns on our bodies. Did you know that doctors attribute up to 90 percent of illnesses to stress? That’s an extraordinarily high percentage that is stress related! In addition to exercise and diet changes, meditation is also extremely helpful in healing fibromyalgia. How Will a Juice Cleanse Help My Symptoms? The foods that affect inflammation the most are gluten, dairy, corn, and soy. These foods need to be expunged from the body. Fibromyalgia sufferers have something called “liver fatigue” and, as a result, toxins build up in the body that leads to the illness. Cleansing and juicing in this manner will support the proper function of the liver, kidneys, and bowel in order to release toxins. Think of it as a “reboot” for your body. By adopting new habits, the autoimmune system won’t have to work so hard to release toxins. Lack of nutritional elements in the body overstresses the body and breaks it down over time. The reward for this new lifestyle will be a decrease in muscle fatigue and inflammation and in an increase in energy and vitality. 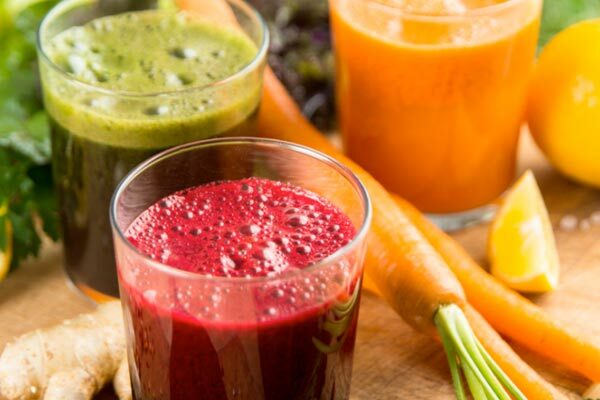 There are many approaches to juicing and it is always advisable to consult a professional before beginning one—especially if you have any serious and chronic health issues. Probably the most common juicing technique is a vegetable cleanse, but many people also include fruit. It’s important to remember that juicing should primarily be about vegetables and fruit should only be added sparingly for flavor. Fruits and vegetables can be ingested in regular form, but juicing is by far the more recommended manner. Most cleanses are done for 3-10 days. If you have a serious illness, 1-2 days only. Giving up caffeine and alcohol before a cleanse is advisable. It helps prepare the body for the work ahead. Reduce red meat leading up to a cleanse. Avoid processed sugars, white flour, saturated fats, and preservatives. Fast food is to be avoided. Drinking tea on a daily basis during a cleanse is recommended. Echinacea and ginger teas are particularly helpful for a cleanse. Consider researching helpful herbs and adding them to your juice concoctions. What Are the Side Effects from A Cleanse? Juicers have reported a variety of side effects after undertaking a detox cleanse. Symptoms including headaches, irritability, and constipation are not uncommon. Dizziness is also a possibility. It is recommended to slowly prepare the body for a cleanse by cutting down on toxic foods over a period of time before going on a full-blown cleanse. Our bodies become addicted to the toxic substances we have long been ingesting, and the physical cravings will exist in the beginning. Think of it like an addict giving up drugs cold turkey. Remember that it takes time to make a true lifestyle change and be kind to yourself if you slip up on your new diet. It can be a long, difficult process, but the rewards are more than worth it. Be patient. The effects of juicing and a new diet may take a few weeks to be fully felt. Our ability to heal our own bodies is nothing short of a miracle. With some knowledge and dedication to following through with a new nutritional plan, detoxing through juice cleansing can be transformational. Best of luck on your new endeavor and may you see the results and freedom from the pain and fatigue of fibromyalgia that you seek.